One of the most poignant expressive devices in tonal music is the transformation of a single tone from being consonant and stable to being dissonant and unstable, at which point the tone seeks to return to a position of stability. Such a transformation is eventuated by a change in the tone’s immediate surrounding. The tone, through this transformation, becomes activated. This basic concept is referred to as the prepared dissonance in music theory terms, and the paradigmatic exemplification of this device is the suspension figure, which contains three parts: the consonant preparation, the dissonant suspension, and the consonant resolution. The dissonance is further emphasized by being accented metrically, being placed on a strong beat relative to its resolution. The suspension figure has been widely used by composers in all periods from the early Renaissance to the present day, but it seemed to have a special place for Baroque composers guided by the Doctrine of the Affections. There are even Baroque pieces that seem to about the suspension. The prepared dissonance is expressively charged, one might say. The strength of that charge depends on various factors in its immediate context. The charge might be intensified, for example, if the duration of the preparation is extended. Or the charge might be weakened by a particular device’s repeated use so that its effect becomes attenuated. One of the most intensely charged prepared dissonances occurs when the moment of dissonance corresponds with a tonicization introduced by chromaticism which induces what can be called a scale-degree reorientation so that the dissonance takes on a less stable scale-degree function relative to its preparation. In measure 2, the blue C4 is a prepared harmonic dissonance created by the change of harmony in the upper voices. In chordal terms, it is transformed from being the root of the measure 1 chord (C major) to being the seventh of the measure 2 chord (D minor seventh), a shift from the most stable of chord members to the least stable. This C4 seeks out stability and finds it by sliding down to the B3 in the following measure, the downward stepwise resolution being the normative path of resolution taken by chord sevenths. The remaining light blue notes in the example are prepared dissonances of the same kind as this measure 2 C4. Nothing said here is the least bit groundbreaking. The prepared dissonance is one of the most basic devices in tonal music; one might even say it is a foundational element to its expressiveness. Likewise, the recognition of the expressive affect that fresh new tones can have in a foreground texture is hardly a brilliantly perceptive insight. But as a composer, I am always contemplating how it is one might harness the expressive power in those deeply moving works in the traditional tonal idiom and adapt it to other expressive languages. The purpose of the color-coded analysis described below is therefore more an attempt to push to the forefront of my own composerly mind those basic devices which I think give tonal music much of its expressive power than it is an attempt at a comprehensive analysis of tonal music. There are four labels—P, N, H & S. P represents a prepared dissonance; N represents a newly appearing tone; H represents a harmonically dissonant, and therefore activated, tone; S represents a tone whose scale-degree function has been reoriented (via tonicizing chromaticism). Therefore, wherever an S appears, an N should be nearby (with the possible exception of a tonicization of a minor key’s submediant–that is, its relative major key). There are eight colors in all representing combinations of the four labels above. Four colors are devoted to prepared dissonances (P) and four are devoted to newly appearing tones (N). Light Blue – PH – A prepared dissonance whose dissonance is harmonic (as opposed to a non-chord tone dissonance). Dark Blue. – PS – A prepared tone that undergoes a transformation to a less stable scale-degree function by way of a tonicization. Pink – PHS – A prepared dissonance whose dissonance is harmonic and which undergoes a transformation to a less stable scale-degree function by way of a tonicization. Orange – P – A prepared dissonance whose dissonance is of the non-chord tone variety and/or a dissonance whose resolution is achieved not by its resolving into a stable relationship with the surrounding harmony but rather by the resolution of the surrounding harmonies to it (exemplified best by the pedal tone). Light Green – N – A newly appearing tone which is neither harmonically dissonant nor involved in a tonicization (e.g. a chromatic passing tone, or a mode mixture tone (e.g. Picardy third)). Maroon – NH – A newly appearing tone that is harmonically dissonant. Light Purple – NS – A newly appearing tone that carries with it an unstable scale-degree function (ti, or fa when in a dominant sonority) (within the key tonicized by the new tone). Bright Red – NHS – A newly appearing tone that is harmonically dissonant and that carries with it an unstable scale-degree function (within the key tonicized by the new tone). Generally speaking, the brighter the color, the more expressively charged the tone (all other contextual factors being equal). The S tones which either are dissonant or are newly appearing (N) are close together on the color spectrum: pink, purple and red. These colors indicate shifts in tonal centers, whether temporary or not. As an analytical approach, such a color-coded strategy is obviously limited in scope. To name just one limitation, while this Bach prelude may be particularly well-suited for the implementation of such a strategy given the extent to which the harmonic voice-leading accounts for much of the piece’s expressiveness, the strategy says nothing of the larger-scale melodic trajectory that gives the music most of its forward propulsion. Much like roman numeral analysis, it falls short of significant analysis, stopping primarily at the level of description. Where it perhaps has an advantage over roman numeral analysis is in its highlighting (literally!) of those tensional elements embedded within the surface texture which can account for at least part of the music’s expressiveness. In addition, it also accentuates linear aspects that are left untouched by roman numeral analysis. Still, like roman numeral analysis, it requires accompanying explication. The Db3 in measure 4 is pink (PHS) because it is a prepared harmonic dissonance (7th of the Eb major-minor seventh chord) whose scale degree orientation shifts from being a dominant pedal to being the subdominant of the tonicized Ab major key area. This pink note dissonance is especially charged expressively due to the length of its preparation (3 full bars of tonic pedal), to the extent of both the harmonic transformation (from the most stable root of the Db major chord in m.3b to the least stable seventh of the Eb seventh) and the scale-degree reorientation (from the most stable tonic scale degree to the activated scale degree 4) it undergoes. In an ideal world, my colors would have shadings that signify the relative strength of expressive charge within each category. The chord in measure 15a is identical to the one in measure 23b, yet the application of this analysis renders them very differently colored, due to factors in each of their surrounding contexts. In measure 15, the Eb3 is rendered black because it is the expected resolution of the ascending bass line from the previous measure (C-D-Eb) and is heard as tonic. In measure 23, the Eb is rendered orange (H) because it is heard as a dominant pedal tone in an Ab tonality (even though the immediate chord is one that tonicizes A-flat’s dominant, Eb). The Cb4 is maroon (NH) for being a new note that is harmonically dissonant (the seventh of the D fully diminished chord it creates with the tones above, but also an unusual “dissonant 6th” above the bass which resolves downward to a P5 with the bass in the second half of the measure). The Cb in measure 23 is pink (PHS) because it is prepared in the preceding chord (though in another voice), it is a harmonic dissonance in the same way the measure 15 Cb was, and it undergoes a scale-degree reorientation since its function as scale-degree 6 (in the tonicized key area of Eb) is relatively less stable than the scale-degree 3 function it held in the previous half measure (in the Ab tonality). The measure 15 upper notes are light blue (PH) because all are prepared and none undergo scale-degree reorientation. In measure 23 the purple (NS) D4 and the pink (PHS) Ab4 would be light green and light blue respectively if the harmony did not involve scale-degree reorientation. The fact that one or more of these notes may have been analyzed differently, with different color renderings, indicates that decisions must still be made within this color-code method. 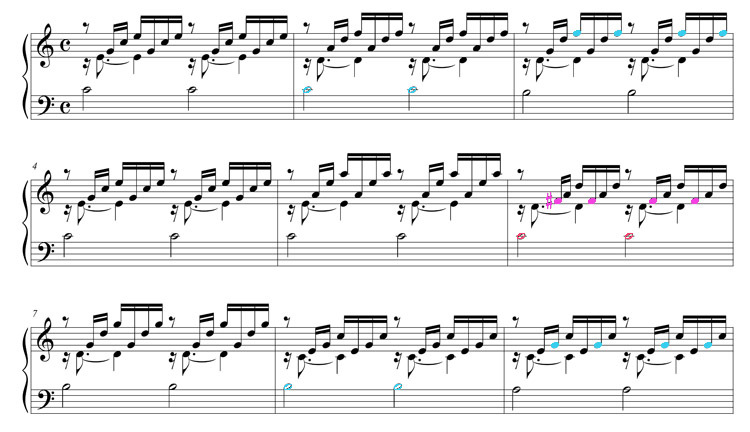 The first chord in measure 12 gives an indication of where my color-coded method is limited. The Eb minor seventh chord looks relatively black with only one light blue (PH) Db5, suggesting that the chord is relatively uncharged expressively. The color code fails to show that the chord is actually an unexpected resolution of the Db major-minor seventh immediately preceding it. Gb major is most likely expected, especially given the fact that all 6 dominant seventh sonorities heard prior to measure 12 resolve normally to the expected chords they tonicize. The Eb minor seventh chord is not extremely far afield from the expected Gb major (especially since all the the latter’s tones are embedded within the former), yet the deceptive resolution of the Db major-minor seventh is clouded by its being in first inversion putting the temporary leading tone in the bass and by both the Eb minor chord’s containing a chord seventh and its appearing in first inversion. In other words, we often hear V7-vi deceptive progressions but hearing a V65-vi65 deceptive progression is much less common. (A similar unexpected resolution occurs in measure 16, though color rendering marks it as more highly charged. More on this measure later.) In sum, in this color coded system there is the possibility of failing to highlight certain syntactical divergences such as unusual chord progressions. Two notes (G3 in measure 6 and C3 in measure 20) have parentheses around them. Both notes are similar in function and were given parenthetical light blue (PH) color renderings because they can be heard as reappearing remnants of the previous chord, creating a kind of delayed retardation figure. The G3 in measure 6, for example, is heard in measure 5b, and its reappearance in measure 6 produces a kind of echo of the G-Ab resolution that occurs on the downbeat. The first chord in measure 16 is quite interesting. Is it simply a simultaneity produced by the linear voice-leading driven by the two descending chromatic lines (Ab-G-Gb-F in the soprano; D-Db-C-Cb-Bb in the lower alto register)? That answer (or non-answer) does not do justice to the sequential progression embedded here. The issue is the F3 in the bass at measure 16. Why did Bach choose F?? Without it, the progression is much clearer. There are a number of parallels between this prelude and the C major prelude from WTC1 mentioned above. This measure 16 of the Db major, in my mind, corresponds to the infamously ambiguous measure 23 in the C major. How would you explain the F in m.16?? 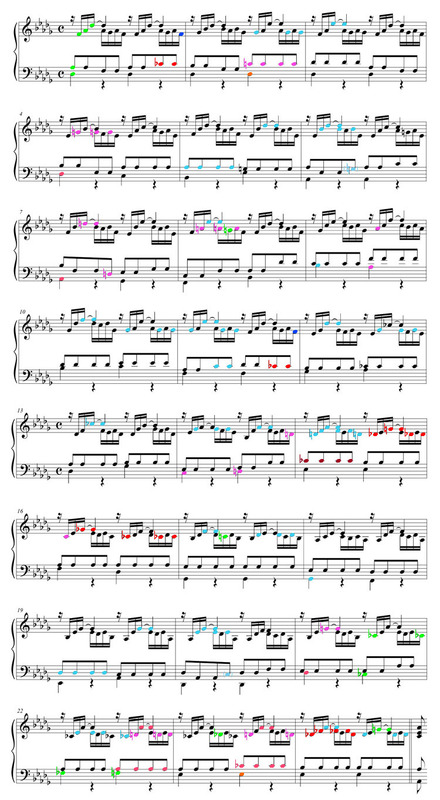 This entry was posted in Uncategorized and tagged analysis, bach, color-code, music theory, prelude, WTC. Bookmark the permalink.